All photos by John Winterman. 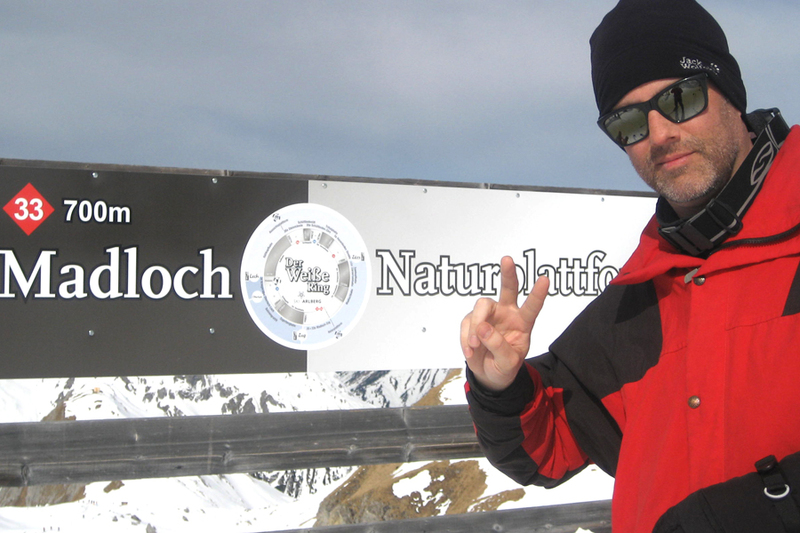 It didn't take long for John Winterman to realize that Zürs Lech am Arlberg was the ultimate Alpine skiing destination. Old-world charm, late-night beers, and just the right amount of lace. 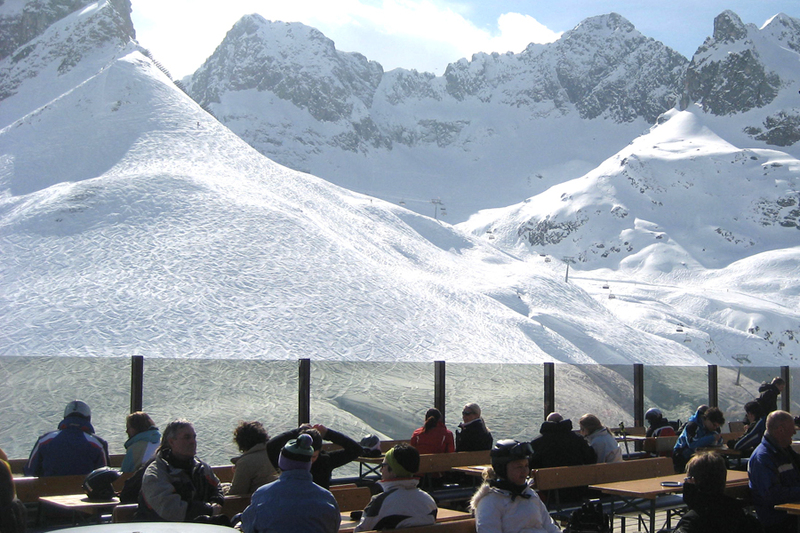 ZÜRS LECH AM ALBERG, Austria – When it's freezing in New York City, everyone flees to the Caribbean. Not me. I head for even colder climates. Bring on the blizzard. My buddy moved to southern Germany six years ago, and when I started visiting him in the winter to ski, I found conditions that were great and temperatures that aren't nearly as cold as those in NYC. Our first trip was to Lech Zürs am Arlberg, neighboring towns Zürs and Lech in the Arlberg, within the Voralberg region of western Austria, between Switzerland and Germany. Another year, we skied Kitzbühel in Tirol. It was great, but we've stopped exploring other options. 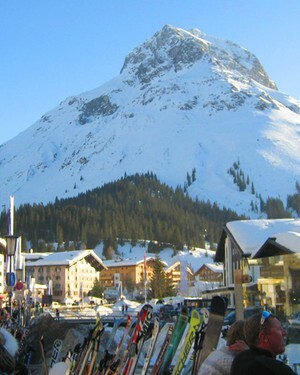 Lech Zürs am Arlberg, known as the Cradle of Alpine Skiing, has been attracting glitterati to its pistes for decades. Add to this the hospice towns of Steuben and St. Christoph, the renowned nightlife of St. Anton, an average of seven meters of snowfall per season, 84 lifts and cable cars, and the Ski Club Arlberg, founded in 1901, and it's more than enough reason to go back year after year. The area had touched us. We knew we'd see the same people, the same hotel owners, the same bartenders. I like walking into the Hotel Edelweiss and thinking, I'm home. Why would we go anywhere else? 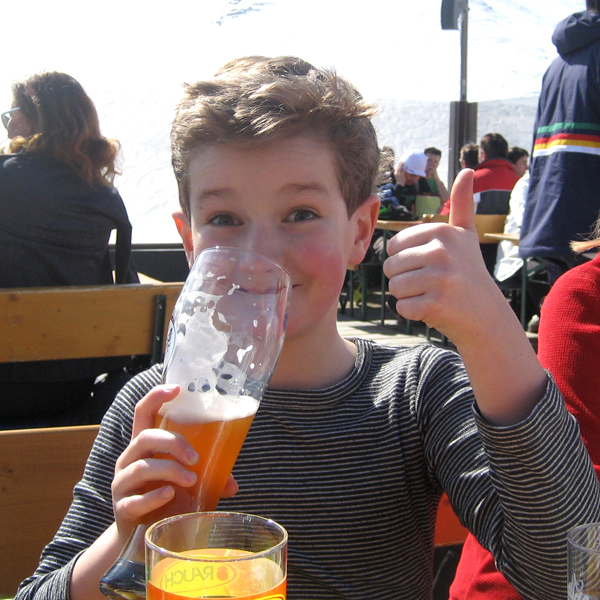 The vacation is easy living: You ski during the day; you consume hearty Mitteleuropean comfort food and beer at night. The area attracts a European, German-speaking crowd. You don't hear a lot of English. Zürs has a classic Tyrolean feel, with extreme levels of old-world comfort. (The Germans never met a corner they couldn't put a banquette into.) 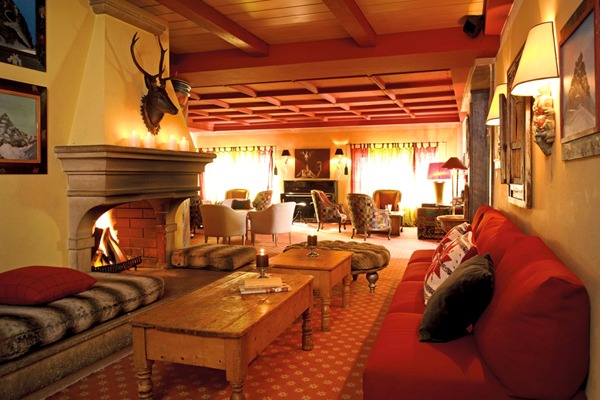 Even the high-tech spa at Sporthotel Enzian is decked out with lace, fabric, animal heads, fireplaces, and pillows. At family-run Hotel Erzberg, a corner off the elevator is decorated not only with a cozy chair but also a blanket, book, and reading glasses. No one is actually sitting there reading; it just feels like it. It doesn't matter where you stay, because the whole area is well connected and distances between towns are mere kilometers. One ticket gets you access to the whole ski area, and within two lifts and a gondola, you can pretty much go from slope to slope and town to town: Zürs, Lech, Oberlech, St. Christoph, St. Anton. Der Weiße Ring ("the white ring") is a 22-kilometer ski run that connects Zürs to Lech, Oberlech, and Zug. It is easily managed in half a day. If your legs get tired, you can hop a free shuttle back home. In warmer weather, the same route becomes Der Grüne Ring (“the green ring”), and people trade skis for high Alpine hiking gear. Picking up good habits at Bergrestaurant Seekopf. There is no shortage of options for kids: ski schools for all age groups, day care if they don't shuss, snow parks, hiking, and swimming pools. Restaurants all have children's menus. Zürs has about 38 buildings. Total. Decades ago, they started restricting construction for avalanche control, and this limits options and created exclusivity. You'll find a wide range of options and prices, but most hotels have a meal plan included and spa services. Old-world elegance overseen by the Strolz family. The bar is the place to be and to be seen. 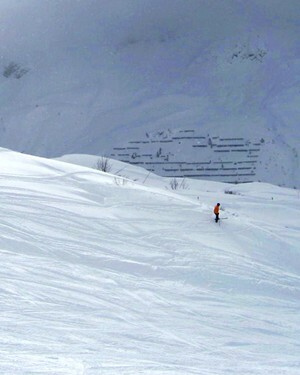 Located directly on the slopes. When you hear "ski in, ski out" this hotel means it literally. An all-inclusive resort at the edge of town with the prices to match. If you want seriously polished charm and like hearing a pianist croon covers of Cure songs while relaxing in an extremely comfortable, full-service lounge, this is the place to do it. Photo: Courtesy of Thurnher's Milchbar. Most hotels include breakfast and dinner in their rates, which makes searching for a restaurant and making a reservation almost pointless. That said, there is food, and plenty of it. The best (!) burger in the area, best enjoyed on the sonnenterrasse (sun terrace) with a cold pilsner. Embrace tradition from a perch of more than 2,000 meters. There is no better Käsespätzle anywhere. 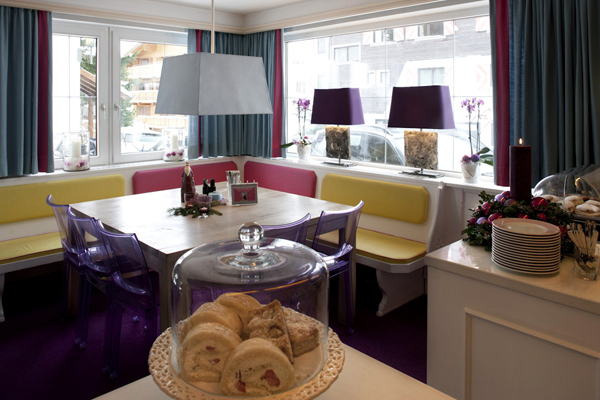 A trendy cafe where vibrant pastel shades juxtapose cute servers wearing dirndls. The legendary restaurant where disgraced wine collector Hardy Rodenstock held some of his over-the-top tastings. Refreshingly, sports bars do not seem to exist in this area of the world, nor do many televisions. 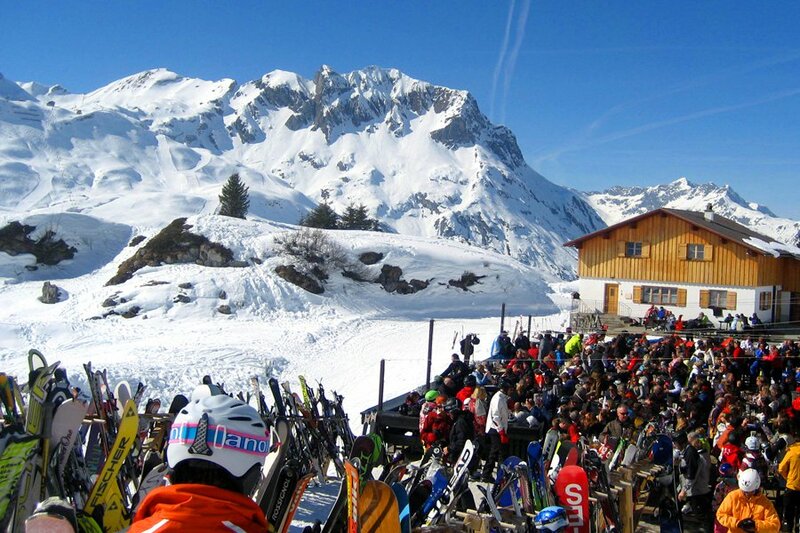 Social interaction seems to be the après skiactivity of choice. Here 's where to get the best of it. A concept bar where everything is made of ice and Swarovski crystals close to the Schlegelkopf summit station. Right in the center of town, near the Rufipassage, where the party goes late into the night. I have been told numerous times that this place does not get going until late, so I finally stopped going before 2 a.m. 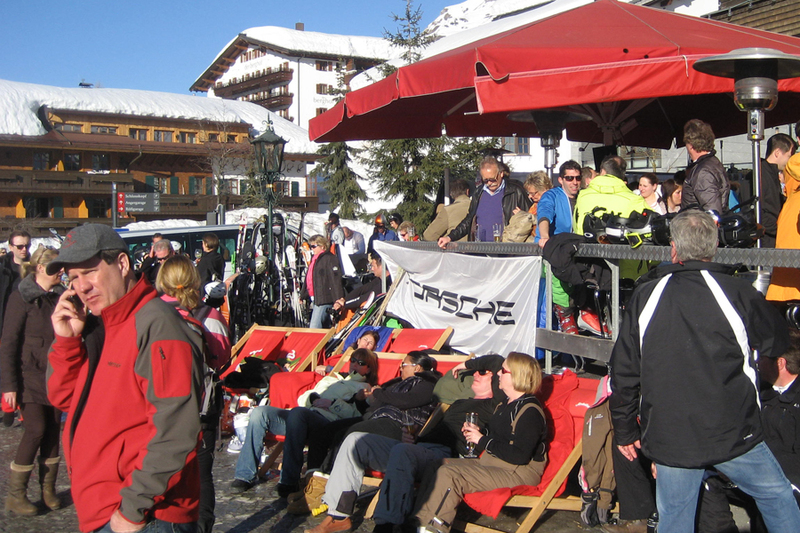 This is the place from 3 - 7 a.m.
A fun outdoor apres-ski bar (with lots of heat lamps) on the river that bisects Lech. Excellent people-watching. How to get there: Most international carriers fly direct to Zurich International Airport (ZRH). 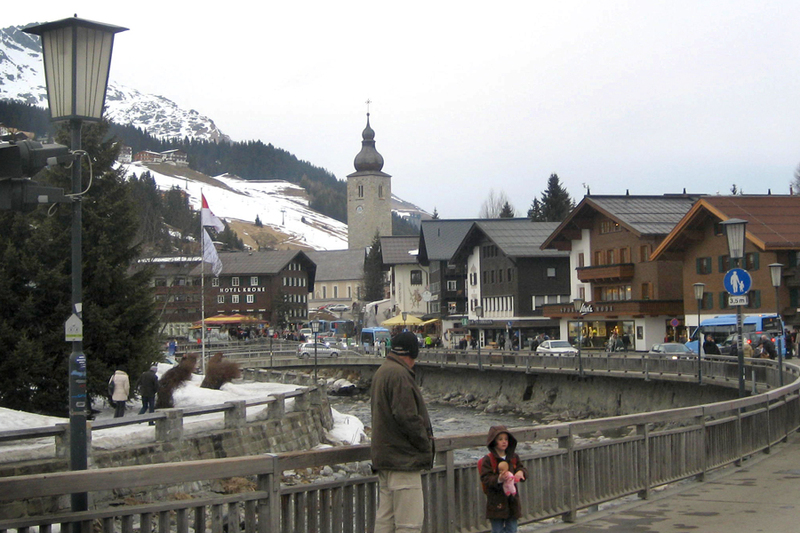 From Zurich, take an express train from Zurich flughafen or bahnhof to St. Anton am Arlberg. You can arrange a taxi or hotel shuttle from there. 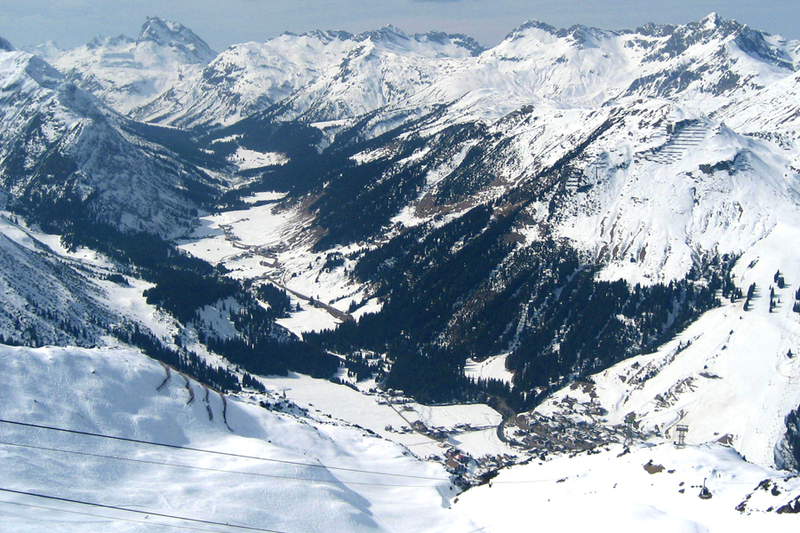 Alternately, take the Arlberg Express bus from Zurich. Taxis can be frighteningly expensive (25 Euros for three miles). Better to use The Blue Fleet, the lovely shuttle that transports skiers from Lech to Zürs and to the lifts at Rauz for access to St. Christoph and Steuben. Summer high season is centered around Lech, as Zürs pretty much shuts its doors after winter. Summer activities begin in earnest on June 21 and end around first week of October. Tips: Tips are appreciated but not expected. Add ten percent for special service, but note that since most credit card receipts do not include a line for gratuities, you'll have to tell the server to add your tip to your bill. Dress code: Even though this is a sports town, it's an exclusive and polished destination. It's not unusual to see people wearing dinner jackets with pocket squares or suede shoes in a blizzard. Dress accordingly. Intersport - Ubiquitous and easy for rentals. Sporthaus Strolz - Another good rental spot. Friendly Brandle - They'll deliver to your hotel and pick up, saving you an extra trip. Lift tickets: Lift tickets are good for the entire Arlberg region and are available in your hotel, as well as at the base lifts and gondolas. Lech Zürs am Arlberg - General info and area resources. La Loupe - A lifestyle blog about Lech and Zürs: food, shopping, sports, bars, and more. Voralberg Travel - General info and resources for the Voralberg. For those who speak German, Fünf-Sterne-Kerle Inklusive ("Five-Star-Guys Included"), by Gaby Hauptmann, is a novel about the extraordinary atmosphere of Hotel Edelweiss and its guests, many of whom actually recognize themselves in the characters. As a bonus, it's an authentic travel guide to the ski routes and restaurants in the story. John is a hospitality personality (the maître d’ at Daniel in New York City) who deals in human fulfillment. You can follow him on Twitter at @johnwinterman. He travels for the experience of looking at the world from 3,000 meters.